Mix operators offer JonDo users IP anonymization as a service. Multible encryption of data protects the JonDo users for spying by mix operators. InfoServices transfer information about available Mix services to the JonDo users. Billing between JonDo users and service providers is done by JonDos GmbH. 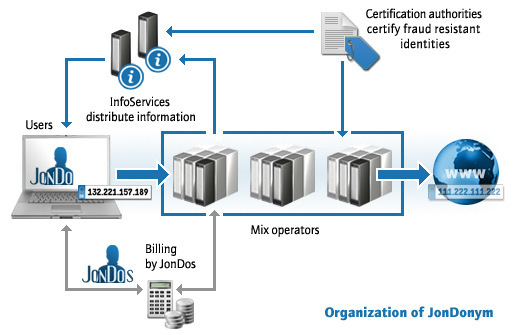 Certification authorities certify fraud-resistant identities of InfoServices and Mix services in order to protect JonDo users against evil service providers. They conduct reliability checks for the operators and may sanction violations against their contract. Besides software development and billing operations for JonDonym, the JonDos GmbH issues certificates for Mix operators. The AN.ON-Team certifies only services of the TU Dresden.